Liferay lets you open Microsoft Office files that reside in Documents and Media. You can open the files from Microsoft Internet Explorer or open them directly from your Microsoft Office applications. Let’s open a file from your browser first. Liferay lets you launch Microsoft Office right from folders in Documents and Media. First, find the Microsoft Office file that you want to edit. Then click the drop-down icon in the upper-left corner of the document’s thumbnail and click the Open in MS Office link. Liferay launches Microsoft Office and prompts you to log in using your Portal credentials. Once logged in, the file opens in your Microsoft Office application. 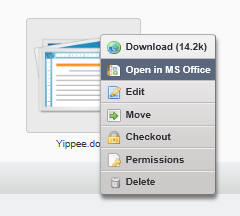 Figure 4.10: Open Microsoft Office files from within your Internet Explorer browser by clicking the Open in MS Office link. When you save the file, it is stored automatically in the Documents and Media folder from which you opened it. This feature currently limits you to opening Documents and Media files whose titles end in their file’s extension (e.g., .doc, .docx, .xls, .xlsx, .ppt, or .pptx). See http://issues.liferay.com/browse/LPS-31223 for more information. Note that 64-bit Microsoft Internet Explorer and 64-bit Microsoft Office versions do not currently support this feature. It is only supported on 32-bit Microsoft Internet Explorer versions with 32-bit versions of Microsoft Office. See http://issues.liferay.com/browse/LPS-28718 for more information. Next we’ll show you how to navigate your Documents and Media folders and open a file from the Microsoft Office application. Liferay lets you access Microsoft Office files in Documents and Media directly from your Microsoft Office applications. Liferay implements the MS-DWSS SharePoint protocol to allow saving and retrieving documents from Liferay Portal as if it were a SharePoint server. You can conveniently update your Microsoft Office (Office) files without having to exit your Office program. For example, if you are working in Microsoft Word locally on your machine, you can open a file from Documents and Media to view or edit it. Simply select File→ Open in Word and enter http://localhost:8080/sharepoint/ in the file name field. Click Open and log in using your Portal credentials. Figure 4.11: Enter the URL of your sharepoint location on Liferay to access Documents and Media. In the list of folders displayed, navigate to guest → document_library and select All Files to see your Documents and Media files. Open the desired Word file to make changes. Click Save when you are finished and close the file. Now anyone with appropriate permission can see the latest version of the file with these updates. Liferay takes care of version control as well as file check out and check in. Users can add comments, ratings, and tags. The Microsoft Office integration feature is currently broken for Windows 7 on Liferay CE 6.1.1 GA2 and EE 6.1.20 GA2. See http://issues.liferay.com/browse/LPS-33762 for more information. Liferay’s integration with Microsoft Office lets users leverage Documents and Media in managing their Office files. Collaboration is simplified as users share their most up-to-date versions of Office files. Now let’s look at configuring the Documents and Media portlet.